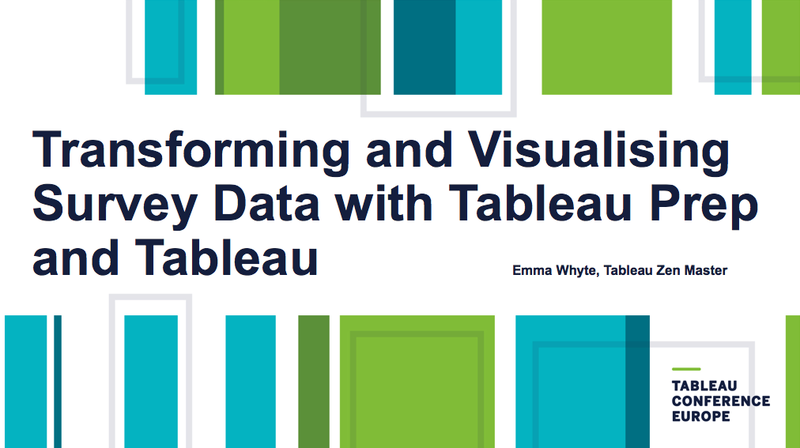 I was fortunate enough to deliver a session during TCEurope 2018 in London: "Transforming and Visualising Survey Data with Tableau Prep and Tableau". I did a complete walk through of how to clean and structure your survey data in Tableau Prep, plus some ways of visualising the data in Desktop. The session is now available on Tableau's YouTube channel for all those who wish to watch it. I started my Tableau journey in 2012 as a Market Researcher working mainly with survey data. I worked primarily with survey data in Tableau prior to joining The Information Lab in 2013. I've been through all the head scratching moments and collated some interesting ways of visualising the data too. Hopefully I can pass on some of this knowledge to others. I also teach a survey data class at The Data School. Any questions, please feel free to reach out on Twitter.